Ableton Link and Machinedrum MIDI sync over network = perfect sync and no MIDI jitter? I posted this elsewhere but figured this was probably the best place to ask. I want to sync my Machinedrum with Ableton so that I can record sounds, loops and patterns from MD for further tweaking, processing, editing etc. I need the recorded audio to be perfectly in time and properly aligned to Ableton’s grid. Now, whoever’s been trying to achieve this in the past, knows that although it sounds like a simple thing to do, it is actually impossible to accomplish by using just standard MIDI cables between the MD and computer’s audio/MIDI interface. No delay compensation settings or any other adjustments in Ableton or within Machinedrum will prevent what is called MIDI jitter. No matter what setting or what slave/master configuration I use, the result is always the same: BPMs/tempo fluctuates and MIDI sync is off. I have read tens of different forum threads about this issue and none of them had a solution. Some of them talked about Innerclock Sync Lock, which apparently is amazing and solves all MIDI clock related problems, but it is way too expensive for my taste and budget. There was also someone recommending sync’ing hardware and software with Ableton Link. Anyone tried it? I am particularly interested in Machinedrum and Ableton users’ insight. Maybe there are people here who managed to successfully MIDI sync their hardware and software this way. Does the fact that Ableton Link uses WiFi network instead of MIDI cables really eliminate MIDI jitter and tempo fluctuations? Also, am I right saying that all I need to achieve this is my iPhone, Apple camera connection kit (Lighting to USB) or something like iConnectivity iConnectMIDI1 MIDI Interface and one of the free apps such as MIDI Link Sync or Link to MIDI? I would have MIDI cable going out of MD into the Elektron Turbo MIDI-1 interface and a USB cable out of TM-1 connected to my iPhone through camera kit. iPhone would be running the app, which would link with Ableton on my computer over the network. Anyone out there using this setup? Does it really work better than standard way of doing this with MIDI cables? I used the ERM Midiclock+ to achieve a stable midisync. By that time I had an octatrack and a machinedrum synced with ableton. Thank for your reply faktoid. I am aware that there are hardware boxes able to provide a stable MIDI clock, however, at this moment I am only interested in getting it through the method I described in my first post. Unfortunately I am not able to test this for the next few days, hence my question here. You’re at the mercy of the weakest link in the setup, in this case, the MIDI interface at the iPad end. Though from practical experience I find it to be a non-issue (YMMV with regards to which interface you use). I have several machines and iPads setup in this way, feeding into one mixer, it is very tight. I still say the best way to do this is sync the tempos manually, ie. just set tempo to the same number, and practice practice practice. Especially if all your doing is grabbing loops…just start recording and then shift the entire recording later - works great in any daw. 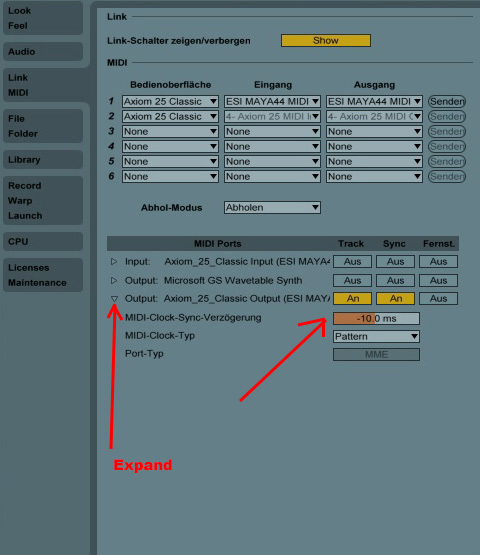 set the MD to “External Sync” at first and use Ableton as Master. now go to Options. Under the “MIDI” tab you are able to adjust the “midi-clock-sync-delay”. for better results, it’s better to deactivate all the stuff under Track/Sync/Remote that are not in use. a value between 10 and 20 ms works quite fine in my case. i use a classic internal MIDI/audio interface btw. no USB. Thanks for replying but if you read my first post again, I did say that the obvious way of sync’ing the MD with Ableton (or any other DAW actually) with the use of MIDI cables doesn’t work as it should. MIDI jitter causes tempo fluctuations no matter what you set as master. I have managed to get it working with Ableton Link and both MIDI Link Sync and Link to MIDI iPhone/iPad apps, using the Apple camera connection kit (lighting to USB adapter) and can confirm that MIDI clock is much more stable. With the method shown by MDMnM, I had tempo going from 130bpm to 128.5bpm every now and then, whereas with Ableton link it doesn’t go lower than 129.9bpm, which I think is acceptable. Major MIDI clock fluctuations (up to +/-1.5bpm) between Ableton and Machinedrum happen only when the former is ran on a PC under Windows 10 (which I have in my studio unfortunately). No matter what master/slave configuration and which MIDI interface I use (tried both Elektron TM-1 and Focusrite Scarlett 18i20), the MIDI clock is never stable. If, however, I use the same setup with my MacBook Pro instead of the PC, then it is working fine. By fine, I mean that I still get minor clock fluctuations, but only +/-0.01bpm, which is the same as when I use my iPhone receiving the clock from the MD and sync’ed to Ableton via Ableton Link. So yeah, seems like the PC/Windows is at fault here. Is it a common issue for Windows users or is it something in my setup that I should investigate further? but overall i don’t have much issues with bad latency, so far Ableton is the Master Clock. only at the beginning, after the sequnce is started, it tooks a few seconds till the MD is quite well in synced. i have an quite old ASIO PCi sound cart with MIDI break out Cable. i think those ones are better than Sound Cards with USB interfaces. That‘s an interesting point, I haven‘t tried it with a PCI card yet. But you are totally right, USB seems to cause quite some trouble with Midi Clock. Did u found a Solution with the sync with Ableton Link for Windows 10 ? Im running into the same issue…using Ableton link between Windows, Linux and Mac. Sync between Linux and Mac works flowless…Windows give a slightly out of sync. Ive testen Bitwig, Ableton, Machine 2 for Windows, MacOS…and everytime Windows is out of sync.